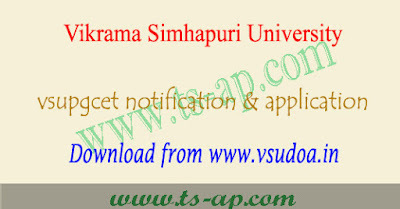 VSU PGCET notification 2019-2020, vsu pg entrance online apply :The Vikrama Simhapuri University (VSU Nellore) published the VSU PG Entrance Test Notification and invited the vsu pgcet online application 2019 for the admission in Vikrama Simhapuri University. The VSU PGCET Apply Online link is made available on the official website www.simhapuriuniv.ac.in or www.vsudoa.in until 10th May 2019. Earlier officials released vsu pgcet 2019 notification pdf for admission into various post graduate courses for the session 2019-2020. So candidates can check the details in this regard like notification, apply online last date, vsu pgcet hall tickets, results and counselling through this article. Applications are invited for admission into various post graduate courses (M.A., M.Sc., M.Com., M.S.W., M.Ed and M.P.Ed.) offered by Vikrama Simhapuri University, Nellore at its constituent and affiliated colleges during the academic year 2019-20. The admissions into the above courses are through the Post Graduate Common Entrance Tests conducted by Vikrama Simhapuri University, VSUPGCET–2019. Before applying, candidates have to check the VSUCET Exam Eligibility which is clearly furnished in the official notification. Those submit the VSUPGCET 2019 Online Application form after the last date or submitted incorrectly shall be rejected. Those who are applying for entrance examination have to pay the application fee of Rs. 500 for General category and Rs. 400 for SC/ST/PHC category. Candidates have to submit the vsu pgcet application form 2019 through online mode only. Those who submitted after May 10, 2019 have to submit with the late fee. A Separate registration is not required for each Entrance Test. The Candidate can apply more than one admission test in single registration. But such candidates have to pay the applicable fee depending upon the tests selected. (Rs. 400/- for each test). Online Submission: Application should be submitted online in the website www.vsudoa.in. If the candidates apply for a particular test and if found to be not eligible for that test, the test fee paid will not be refunded. Hence the candidates are advised to go through thoroughly the eligibility conditions given in the instruction booklet before applying. Convener, VSUPGCET-2019, Vikrama Simhapuri University, Kakutur, Nellore – 524320. The eligibility criteria for admission into each course along with the entrance test one has to qualify are given below. Refer to Section B to find out whether the course is available in Campus College or PG Centre or affiliated colleges. M.Sc. Computer Science B.Sc. Computer Science / B.C.A. / B.A. Computer Applications / B.Com. Computer Applications / B.Sc. Computer Applications / B.Sc. Mathematics combination / B.A. Mathematics combination or any degree equivalent to B.Sc. Computer Science. B.A with AES group or B.B.M. or B.B.A. (10+2) Scheme with Biology as one of the subjects or equivalent qualification. (Script Writer / Reporter / Sub Editor / Photographer / Technical Assistant/ PRO etc..
*Note: NO ENTRANCE TESTS FOR 5 YEAR INTEGRATED & DIPLOMA COURSES. a. Admissions into 5 year Integrated courses and Diploma courses will be based on the marks obtained qualifying examination. b. In case of M.Sc. Human Nutrition and Nutraceutical Chemistry where there are seats for candidates qualified in different tests, the vacant seats in any category (after exhausting the complete list) will be filled with candidates of other categories. Similarly for M.S.W., where there are seats for two eligibility criteria, the vacant seats in either category will be filled with candidates of other category.